How to leave a comment? Easy diy braids, updos, half-ups, no-heat curls, sport hairstyles, short hairstyles, haircare advice, and more! Hello again! 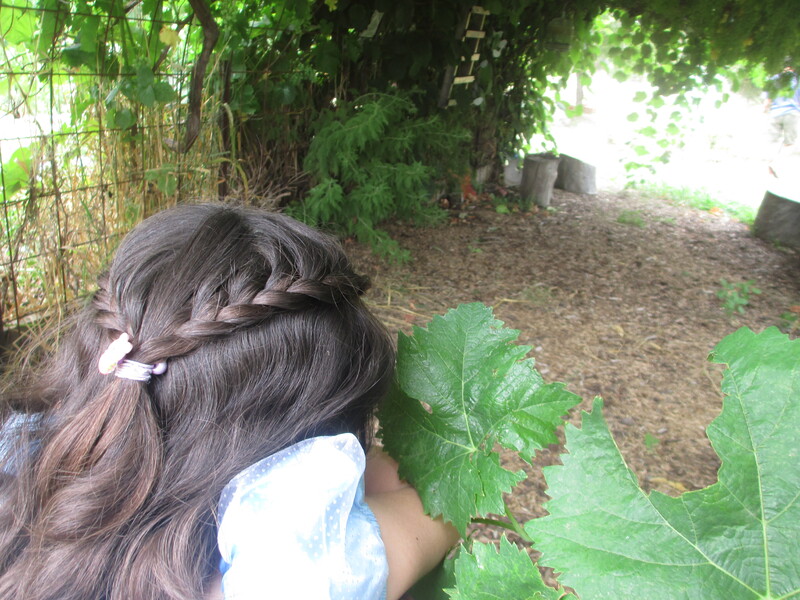 I got very excited one day when my siblings came home talking about the picturesque grapevines in the school garden. 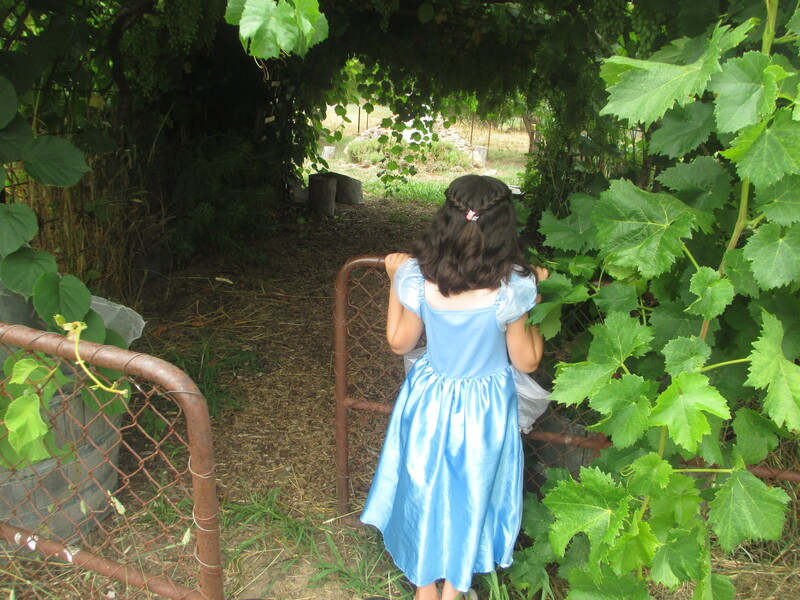 So I dragged my sister out (on her birthday, in her Cinderella costume) to try and get some nice photos! In the end the grapes didn’t show up so well, but the hairstyle went alright. 😀 A big thank you to her for being so patient! 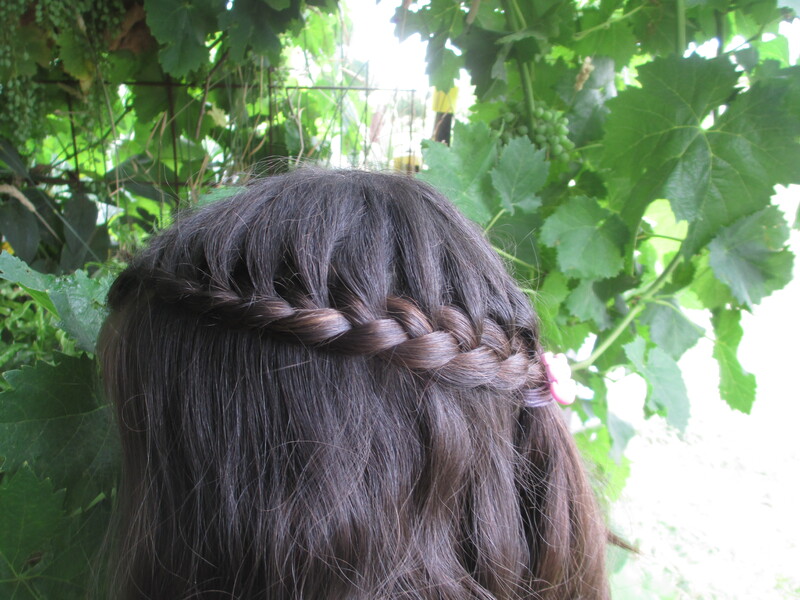 I hope you all enjoy this week’s hairstyle – a lace braid fit for a princess. Part hair as desired (I used a middle part) and take a small section of hair above the forehead, next to the part. Split into three segments. Now you start your lace braid – this is the same as a simple French braid, except that instead of taking up new hair from both sides, you only pick up new hair from the top section.. Starting on the left side of the head, place the left-most strand over the middle strand, (making it the new middle strand), and put the right-most strand over the new middle strand. Put the left-most strand over the new middle strand, and, gathering up some extra hair from the middle (or top) of the head, place the right-most strand over the new middle strand. Repeat until you get to the back of the head..and there’s your lace braid! Once you stop adding in hair, finish off with a simple three strand braid.. Tie off the end of your lace braid (or clip it for now) so that it doesn’t unravel, and repeat steps 1-6 on the right side. Secure the two braids together at the back of the head and then remove the hair ties from the ends of the braids. Pancake the bottom edge of the braid as desired. And voila! Also, don’t forget to send us your suggestions for what you’d like us to do for our one-year blog anniversary here! One Year Anniversary of Seton Girls’ Hairstyles! Really pretty Maria, I really love the last pic! Thank you Clare, yeah, I was pleasantly surprised by how they turned out! Lovely Maria! A bit fancier than plaits, but still sweet and simple! I’ll have to try it on one of my little sisters. This is really pretty, Maria! Great job! Yeah, it looked really nice on my sister! Agh I wish I could braid this well; it looks so stunning! Thank you, I’m glad you liked it! Welcome to Seton Girls Hairstyles!